Today v.1.4 – Introducing the “Welzen” card for your meditations. One of the biggest reasons we started working on Today was our realization that successful habit tracking and formation are at its core a very personal matter and that is precisely the way a good habit tracking app should look and feel. The concept of using cards with unique functionality to create your custom dashboard that suits your personal needs to track your particular habit lies at the core of that notion. We decided to ship the first version of Today with seven types of cards, with the plan to add many more, introducing new functionality and integrations with other services and apps. Today we are delighted to announce the newest member to the family of Today’s cards: “Welzen,” a card to help you track and develop your meditation habit, one of the most popular types of habits tracked in Today. This new type card is the first of many cards that will integrate with other apps and services. This one is the product of our collaboration with our friends at Welzen. Welzen is an excellent meditation app made by a talented and passionate team that cares deeply about Mindfulness and has put a lot of effort to bring you an app that will help you take advantage of the scientifically proven benefits of meditating. It comes with plenty of great features and a continuously updated selection of guided meditations for everyone, helping you fight stress and anxiety, increase your focus, sleep better, improve your relationships and creativity. Using the Welzen card in Today is as simple as adding any other card. 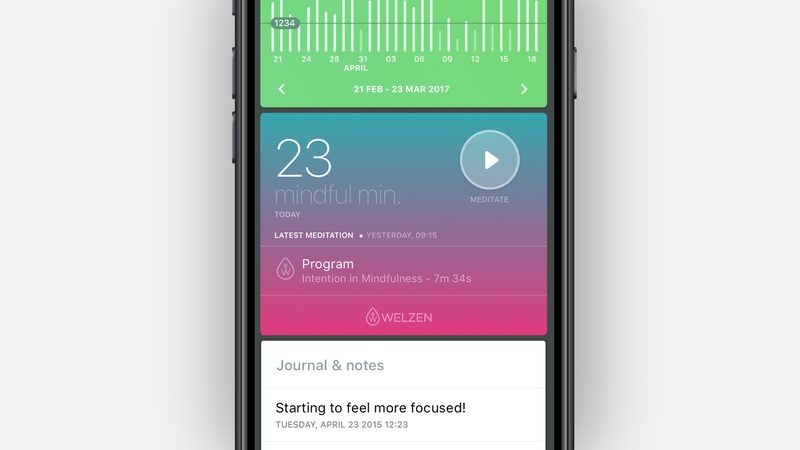 Add it to your dashboard, and it will immediately display the Mindful Minutes that you have recorded in Apple Health using Welzen. It will also display the latest meditation that you recorded in Welzne and quick way to launch the app and start your next session. The Welzen card is available in Today as a free update for all our users and the first of many more new cards that we are currently working on. As an added bonus you will find two new photo covers in Today's gallery inspired by Welzen. Create a meditation habit with Today, add Welzen’s card and start meditating.